We just finished our fourth week of our autumn theme. We’ve spent two weeks on leaves and one week on apples. 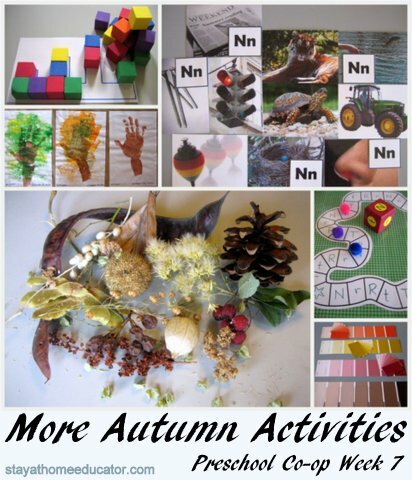 Next week we’ll have some Halloween and pumpkin fun, but this week in our preschool co-op we have been studying how animals and trees use the autumn season to prepare for winter. All theme related activities this week also feel under math and science, which is where you can read more about them. Autumn Tree Study – Over the past three weeks, the students have been watching a tree in my front yard and observing how the tree has been changing during the fall season. Students recorded their observations via hand print trees and sponge painting. 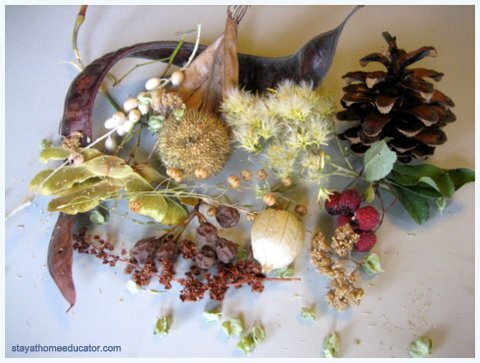 Seed Observations – Students use magnifying glasses to observe seeds found in our local area. I had gathered seeds from various trees, shrubs, and weeds. While the students handled the seeds, I taught them about how plants loose their seeds during the fall, how animals eat or hide them to prepare for winter, and also how those seeds are spread via water, wind, or animals. Me: Listen to the word “tiger.” Let’s clap and count the parts (syllables). Students clapped the syllables in tiger, while I held up a finger for each syllable. Then, the students counted the number of finger I was holding up. Then, I modeled the syllables in each word by holding up my fingers instead of clapping. 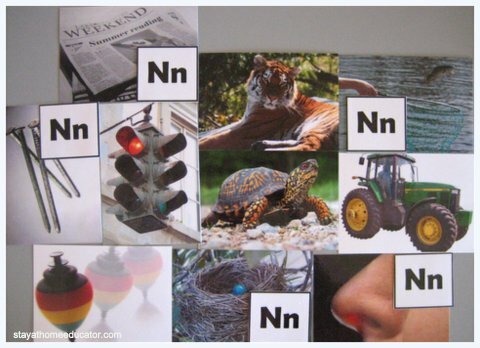 Phonics: Letter Nn – Students learned to identify the letter Nn and it’s sound. I printed and laminated several color photos beginning with the /n/ sound. Examples: nickel, nose, nail, needles, nest, newspaper, and nest. Students practiced saying each picture name, emphasizing the /n/ sound. Students practiced identifying if a word began with the /n/ sound or with another sound. Letter Nn and Tt Review – Students identified photos beginning with the /n/ sound, differentiating them from photos beginning with the /t/ sound. They labeled those photos beginning with the letter n accordingly. 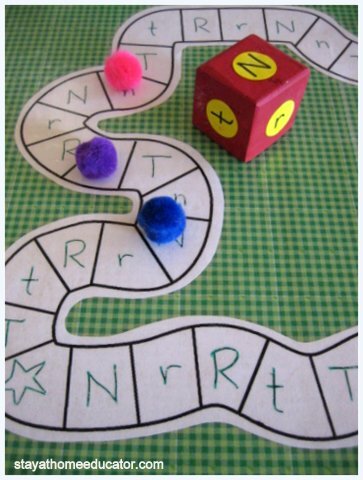 Letter Review Board Game – Students played a simple game to review upper and lower case letters Nn, Tt, and Rr. Using a die with those letters, students rolled the die and moved their marker to the next matching letter…if they sound identify the letter name and it’s sound. To challenge the students, a participating mom (who has been aiding me this month) asked students to name something beginning with the target letter on the die. Note: I covered a blank game board in contact paper so it could write on it with a wet erase marker and change it when needed, instead of making a new game each time. 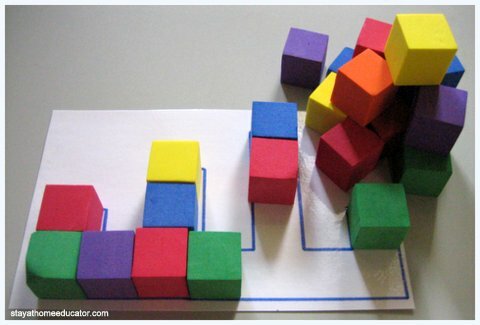 Geometry – Students explored geometry concepts by using inch in foam cubes to fill in designs on pattern cards I’d made. Some students placed their cubes in patterns (an algebra skill) and some students counted the cubes as they placed them (number sense). 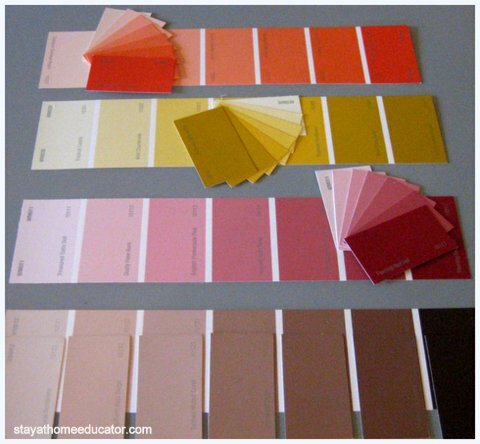 Algebra – Students used paint chips to study gradation of fall colors by making matches. I found my students have a wide range of skill here. Some students noticed the very subtle variations, while others really struggled with making the appropriate matches. Students practiced writing their names using crayons. They also practiced tracing various lines as outlined in my post Preschool Co-op Week 1. Students also enjoyed free play with autumn scented play dough and then make letters out of play dough. Next week will consist of two posts, one on Monday featuring educational Halloween activities, and then my normally scheduled post on Friday, featuring educational pumpkin activities. Thank you for sharing these posts on Fridays. It lets me prepare for the next week ahead. I find your posts super helpful. Thank you for spending so much time to write them out! Wow! Those are great ideas. I love the letter game with dry erase markers. 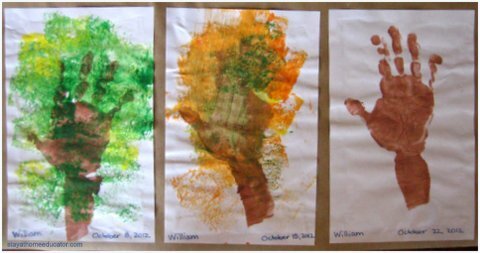 The hand print trees in fall colors are colorful and a fun way to teach about how leaves change color. Oooh love all the things you got up to. Looks so inspiring.